Flying at top speed toward West City, a glum silence remained between the now feminized Vegeta and Goten. It was preferable to anything that could be spoken under the night’s circumstances. At the familiar view of first the city’s skyline, then Capsule Corp, the two of them crouched behind a row of shrubs that hid the garage, just out of security range. They inched as close as possible, feeling confident for the first time, as snagging the Dragon Balls would be a piece of cake. They lightly treaded the blind spot of the security drones when both froze, seeing a shadow pass before the garage window. Instictively they flattened their backs against the garage wall, suspiciously watching the shadow pace back and forth. The Briefs were never up so late on an ordinary night, even less in the garage. The Dragon Balls had been coveted before, and who besides the culprit of their misfortune could it be? Were the household members asleep, or taken hostage? And where was Trunks, as he was often home for the weekend? The Saiyans outside exhanged a worried glance, when a familiar voice was heard from inside. Goten cast Vegeta a desperate look. The latter was less than thrilled at showing up here thus, but it was their only chance at present. Grimly he nodded, and the two of them strode around to the garage door and knocked. “Not one word!” Vegeta snapped angrily as Trunks stood aside, staring at them. 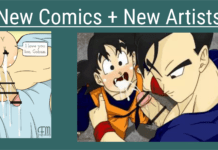 The chagrin on Goten’s face said everything. Both gave up and kicked off their shoes as they entered, now too big for their feet. Noticing, Mrs. Briefs hurried off, returning with neutral tennis shoes that would fit them. Goten took a deep breath. “We went out to a nightclub… yes, it was my idea… then took time out for a nap. Then we woke up like this. Thanks,” he said to Mrs. Briefs. “I thought you smelled like rhum,” Bulma commented, frowning at her racing thoughts. 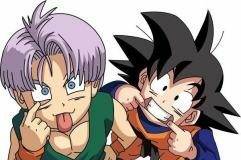 “Club 73?” Trunks asked Goten. Dismissing it, Trunks reported, “Apparently, Videl’s dad called them to say he saw you there, but something was wrong. Gohan will be here soon, but I see now. I don’t suppose you know how it happened? Goten and Vegeta shook their heads stoicly. As though on cue, Gohan’s familiar knock was heard at the door. Mrs. Briefs rushed forth to open it, though she hadn’t said a word the whole time. None of them had yet to see anything that phased that woman. “I don’t suppose he knew anything.” Goten leaned wearily against a wall. Goten and Vegeta left with Trunks and Gohan, flying far enough from civilization to avoid any witnesses. They settled in a small forest clearing, and Vegeta spoke up. “We know you’ve already been summoned, dragon. Would you care to tell us why me and Goten are suddenly female?“ He paced back and forth, seething. Accustomed to Vegeta’s insolence, this time Shenron overlooked it in recognition of his justified anger. He appeared before them in a misty cloud, having expected their quick callback. “That is exact. One wish has been granted, which leaves you two more.” Patiently he waited for their indignant exclamations. Of the two concerned Saiyans, it was difficult to say who appeared more bewildered, but Vegeta was definitely angrier. “WHAT? !” he yelled, outraged at Goten, making him… or rather, her… shrink back. Shenron’s words slowly sunk in, and he asked in dread, “I told you about the Amazon galaxy then, didn’t I?” Goten nodded miserably, and Vegeta face-palmed, hard. That mystery was solved, be it any consolation; it was not. “It isn’t supposed to do that,” Goten hissed back, “In case you forgot, we don’t go around telling people we’re aliens.” He was puzzled as to why he was defending the girls. It would serve them right for their asses to land in prison. “ENOUGH!” Shenron roared, “I’ve no time for your quarrels. I presume your wish is to return to normal?” His voice was dry and rhetorical. “YES!” Goten and Vegeta shouted in unison, then were released by Gohan and Trunks. “I have that power,” Shenron promised, “There is just one detail to verify. It will take… a few Earth minutes.” The dragon faded, leaving his misty cloud as the sign of his presence. All four Saiyans began to to pace, alone with their own thoughts. “C-consequences?” Goten’s face had suddenly drained of color as though he might faint, feeling the dizzying possibility of doing so. Vegeta’s face was that of a deer caught in the beam of headlights. Silence fell over the group, then Gohan and Trunks nodded in seeing reason. “Thank you,” Gohan bade him sincerely. “Yeah, really… thanks,” Trunks added, both very relieved. “I’d rather not think about that, if you don’t mind,” Trunks muttered to Gohan, making a face. Both stonily pointed in the direction of Kasumi-Mori, where their capsule house was. Gohan nodded. “Okay. Have a good night’s sleep, then,” he bade them soberly. “Goodnight, Goten… Dad.” Trunks underlined his father’s title as his way of saying nothing had changed for him, either. “G’night,” Goten mumbled, and Vegeta gave them his two-finger wave before they flew off into the night. Gohan and Trunks watched them leave before the sky’s darkness swallowed them, their worry turning to confidence. Pronouns may be a temporary issue, but they were essentially still the same Vegeta and Goten. For only a month, they figured, how much trouble could their feminine sides be? Returning to their capsule house, Goten fished their key out of an old watering can and let them in, flipping on a dim light in the living room. Not even bothering to shower, they trudged to their bedroom and quietly changed into their customary light pairs of pyjama shorts and T-shirts, not caring that they, too, were oversized, carelessly tossing their expensive silk clothing into a corner. They took turns brushing their teeth, understandably taking longer than usual to relieve themselves before bed. They slid under the sheet in stony silence, each on their own pillow and staring coldly at the ceiling. If either were waiting for the other to speak, they would wait until hell froze over. Though upon closer inspection, their eyes were puffy and glazed with exhaustion, their minds at this point incapable of coherent thought. The comfort of their own bed was a small one, nevertheless appreciated. Mechanically, Vegeta reached over to switch off his lamp, bringing them merciful darkness. And sleep. Quite late the next morning, Goten awoke slightly in their semi darkened room. His memory not yet fresh, instinctively he snuggled close to his mate. He felt a throbbing heat in his loins that screamed its need for Vegeta, instinctively winding around him. Vegeta automatically reacted in kind, holding him close. The desiring heat was there, yet something was different. Both felt more slender. There was no hardness, rather what seemed to be wet and slowly opening, and a gently increasing tingling. It felt good, just so different. Slowly Goten’s eyes opened to meet Vegeta’s own, opened to slits, and leaned down to kiss the lips he adored. Gods, she was beautiful…wait… she? Their eyes opened fully now as their memory returned, and Vegeta slowly let go of Goten, placing his (her?) forehead on bent knees, in an almost foetal position. Their memory of the preceding night came flooding back, both wondering in despair what pronouns they should use for the next month. /She-her,/ their shared thought agreed bitterly. The fact that they were Saiyan-bonded mates… a complex, primitive tradition that eternally united them… afforded them crystal-clear, empathic telepathy, and made Vegeta look up with a spark of hope. But Goten’s eyes filled with tears. She clutched at the sheet, willing them not to fall, and for the lump in her throat to go away. Vegeta delicately took her hand. “It’s not forever,” she told her, her voice softening. Patiently, Vegeta waited for her to speak and stroked her palm, which she liked, gradually calming her. Finding her voice, Goten managed, “You won’t want me anymore, huh? Not for a month at least. Especially since it’s my fault.” The thought brought on a fresh onslaught of tears, and her back shook with silent sobs. “What?” Goten’s voice was muffled, and she clung tightly to Vegeta. “Demisexual,” Goten reminded her, blushing despite herself. Vegeta hesitated, her eyes shutting. “It just feels wierd. I’m not sure what to do… I mean, I know, but…” She looked away, blushing at her turn. Goten smiled, waverly, yet for the first real time since earlier the preceding night. “We’ll figure it out. But I know what you mean.” It was true that actually sleeping with someone was a big deal for Vegeta. The fact made Goten happy, though she wondered if it were truly the same. “Tell me the truth. Do you still want me… y’know, in the same way?” She bit her lip, fearing the truth. Goten’s arms tightened around her mate again. “Why do you always take the words out of my mouth?” She smiled, her adoring gaze indeed like a shining mirror Vegeta never grew tired of looking through. “I want more than your words, Miss,” Vegeta whispered coyly, making Goten shiver with pleasure. She pulled the demi Saiyan atop her, reclining them comfortably back on their doubled pillows to stroke her silken hair. “If I told you how gorgeous you are, I’d make you blush even more,” Goten told her with a smirk, winning the desired blush. Her head rested comfortably on Vegeta’s shoulder while she stroked her firm, soft breasts, a generous handful each that was warm and nice. “Don’t tell me you’re getting a new fetish,” Vegeta commented amusedly, very much liking the feel of Goten’s own against her. “They’re cuddly,” Goten informed her, fascinated with their stiffening sensitivity. Vegeta’s eyes closed blissfully, thinking if Goten kept that up, they would be back asleep in no time. Not that it would be a bad thing, but it was closer to noon than morning, and she was impatient to see if and how their ki had changed. The demi Saiyan grumbled and reluctantly sat up, not doubting either. “Later, I promise,” Vegeta whispered with a seductive smirk. Goten smiled innocently, reaching her feet for her slippers. “Good. You know how hot I like it.” She giggled when Vegeta narrowly avoided walking into the doorframe. “I meant my coffee,” she managed around harder laughter.